These past few weeks I have been thinking quite a bit about what it means to homeschool from a biblical worldview. I’ve learned a lot in the years since we started this home education journey, especially about what is important, what isn’t, and how to hold the line between the two. In Christian homeschooling circles you will often hear that biblical worldview is important. Does that just mean making sure you tell your kids about Jesus? Or doing family worship? Or maybe it means using Christian curriculum? Everyone has a worldview. It simply means how we view the world — what our overall perspective is and how it shapes our experience of the world around us. It is about our most basic beliefs and assumptions. A common analogy is that worldview is like donning colored glasses. It will always affect how we perceive the world. So, what is a Christian worldview or a biblical worldview? It is when we don the glasses of the gospel. It’s when we look through the spectacles of the infallible and inerrant Word of God, seeing ourselves, others, and the world around us in the light of scripture. Why is it Important to Homeschool from a Biblical Worldview? Each year, my husband and I spend time reflecting on how the last year of homeschooling and parenting went and strategizing how we’ll tweak things for the coming year. A big part of that conversation is refreshing our homeschool vision or mission statement. If you take a look at our vision statements from year to year you’ll see a pattern: It increasingly becomes more and more about Jesus. Why? When we look at our children, our efforts to educate them, and any other way we spend our waking hours, we either look at them with a biblical worldview or we don’t. We either consider it ALL through the lens of God’s Word and the gospel of Christ, or we don’t. We want to homeschool from a biblical worldview. There is nothing more important than teaching our kids to know and love the Lord and to love others. There is no goal more worthy than to raise children who walk closely with God and follow His path for them with faithfulness. Fear of the Lord truly is the beginning of ALL knowledge… and no subject can ever really be independent from the knowledge of God. In fact, ALL of this — our parenting, our homeschooling, our life together — is from Him and for Him. 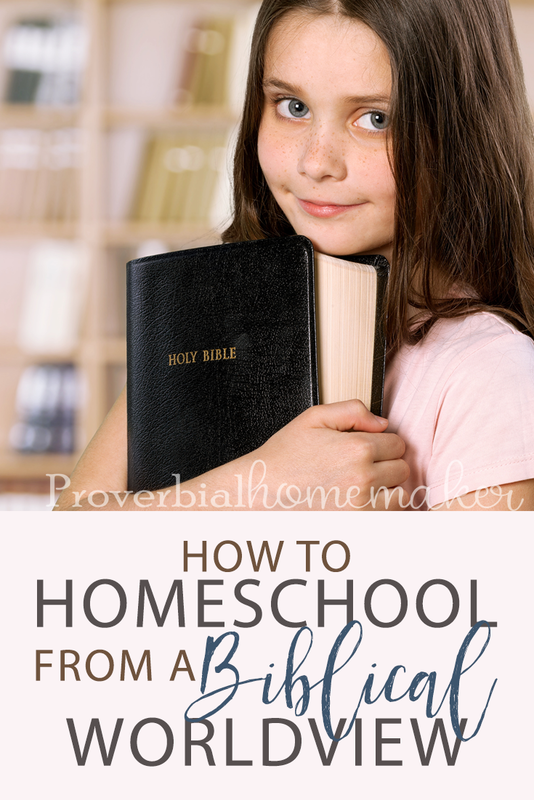 What Does It Look Like to Homeschool From a Biblical Worldview? When you homeschool from a biblical worldview, it doesn’t mean simply teaching that subject at some point, or even just choosing mostly Christian curriculum for our studies. Homeschooling from a biblical worldview means that everything we do is done through the lens of God’s Word and His purposes for our children. Whether we’re mapping their course of study, choosing curriculum, planning their week, or reading together as a family, we do it all with the ultimate goal in mind: that they know and love God, and glorify Him with their lives. The most important thing we can do as parents who want to homeschool from a biblical worldview is to have an accurate one ourselves! Polish those glasses. Study your Bible diligently. I know that we busy moms find that challenging, but be creative to make the time and keep it as a priority as much as you can! Learn about false teachings so that you can recognize them. Have a clear idea of what you believe from a biblical perspective on the various issues of life. You might find it helpful to work together as couple or even with your pastor, considering your church’s statement of faith. But also think about writing down what you believe in specific areas that will come up in homeschooling in terms your children can easily understand: What does your family believe concerning the origin of man? Creation vs. evolution? The authority of scripture? Marriage? The sanctity of life? Start with simple statements and add to your notes as conversations happen. Pray for wisdom and guidance as you formulate these statements together. There are several things we want to teach our children so that they are as prepared as we can make them for a life following God. Although only the Holy Spirit can transform their hearts, and we can trust God to fully equip our children for whatever purposes He calls them to, it is our privilege and our responsibility to teach them these important things. You know… while you teach them addition. 🙂 Sure, these are not small things in the least, but be encouraged, dear mom! You are not alone! The Lord will strengthen you, guide you, and give you the wisdom you ask for in these efforts. He cares deeply about the hearts of your children! We must be careful to choose curriculum and materials that will help us to teach our children all of these things effectively and not work against our instruction. In our homeschool, we choose to use Christian curriculum that takes an overtly conservative biblical worldview, specifically in subjects that we consider most important for growing in and defending the faith: science, history, and (especially in later years) literature. And we find that each year we trade in for even more curriculum with solid biblical worldview because it just makes sense with our goals. While secular science, history, or literature curriculum may provide “teachable moments” to discuss with your kids, I would argue that life will have plenty of teachable moments. They don’t need to be specifically introduced through curriculum. So we keep such resources as a supplement and use them with care. You will want to be especially careful with curriculum or books that don’t align with your worldview when they are being used independently by students who can read well but aren’t quite ready to identify and call out unbiblical ideas without your direct guidance. Does that mean we should never use secular curriculum? I personally believe every subject should be taught with a biblical worldview. Math, spelling, grammar, art, music, language, and so on are all studies of God’s creation and opportunities to reflect on His character. It IS possible to provide this biblical worldview on your own using a secular curriculum if you have a good understanding of scripture. 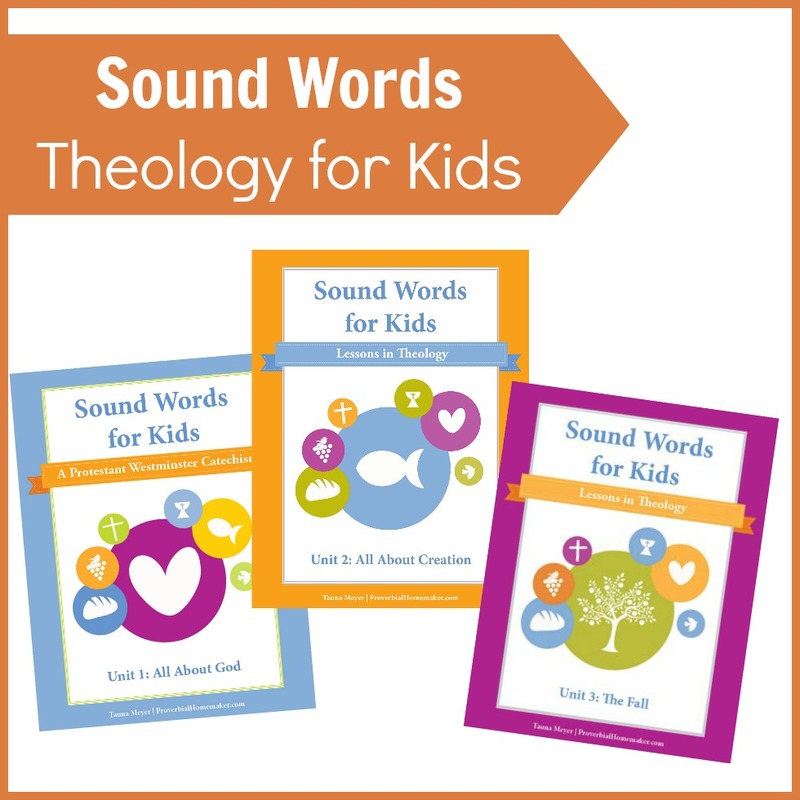 In our family, we do sometimes use secular curriculum for subjects such as math or art, but we have to be intentional in working in biblical worldview conversations, which requires more work and intentionality. It’s something you’ll have to decide on as a family. I also strongly encourage you to research the worldview and statement of faith of the author and/or publisher you are buying your curriculum from BEFORE you buy it. Even some curriculum that is sold as Christian may have unbiblical content or be authored by a non-Christian source. Sometimes you won’t realize this until you are in the middle of using it. Be prepared to call things out that are contrary to what you believe. And if what you find about a curriculum or publisher is very concerning, be prepared to joyfully let go of it, no matter how well it “works” for your child or how easy it is to use. Curriculum is fleeting and there are always other options. It is nothing compared to God’s Word, which never changes. The hardest part of all of this is staying focused and keeping our priorities straight in the midst of busy life and the constant promise of that new activity or curriculum. Stay the course, friends! 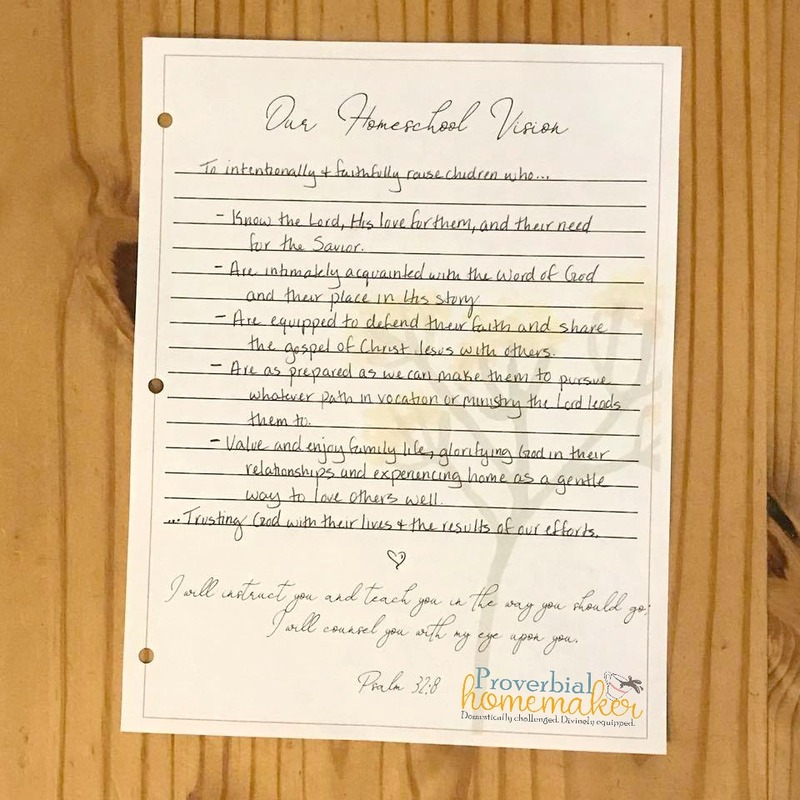 Write that vision statement for your homeschool, keep reading God’s Word and hiding it in your heart, and keep teaching it diligently to your children in every step of your day. Filter all your planning and teaching through the lens of scripture and everything else will fall into place. A wonderful verse and so true! Thanks for that! I was JUST thinking about these very things this week. I think being grounded in our faith is what’s most important.